Eat local. That’s what the growing locavore movement is all about. Now if it would just stop raining long enough for the locals to get the gardens in…we could eat local. 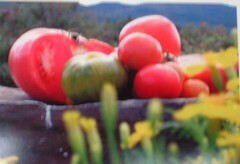 The Tamworth Farmer’s Market will begin on Saturday, May 28th. The Community School Market has plenty of seedlings for sale now. And don’t forget The Farmer’s Table on Thursdays. Here’s a link to find your way around the NH locavore movement. Local Harvest is a resource that can help your patrons find locally grown food outlets such as farmers’ markets, CSAs, pick-your-own farms, and food co-ops. Barbara Kingsolver’s Animal, Vegetable, Miracle; Woody Tasch’s Inquiries into the nature of slow money: investing as if food, farms, and fertility mattered; John E. Carroll’s The Real Dirt: Toward food sufficiency and farm sustainability in New England; Eric Schlosser’s Fast food nation: the dark side of the all-American meal; Jenna Woginrich’s Made from scratch (homesteading); and anything by Wendell Berry or Michael Pollan.